When I first began visiting the Helen and Alan Cruickshank Sanctuary about 5 years ago, I was unaware of the vital importance of the scrubby habitat that this location protects and nourishes. 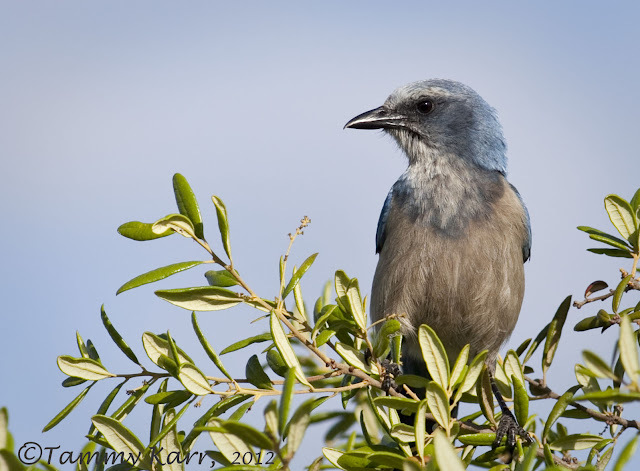 The sanctuary is where my fascination began with the Florida Scrub-Jay, a species whose antics are always entertaining! I still enjoy regular walks on the trails there, where sedentary Florida Scrub-Jays, as well as other species of wildlife, are consistently observed. In addition to developing a fondness for the Scrub-Jay, I also developed an awareness of the Scrub-Jay's plight to maintain its existence. 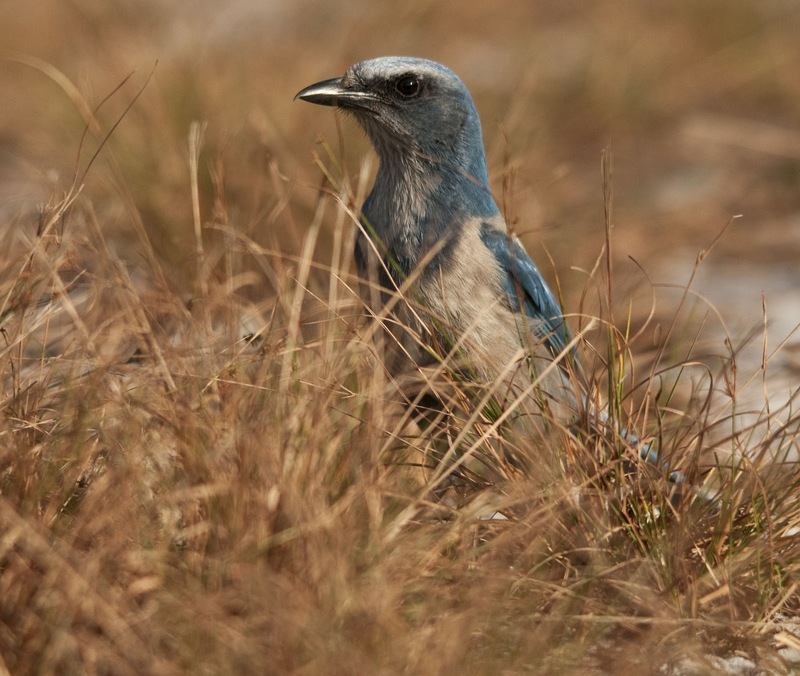 The Florida Scrub-Jay resides only in scrubby flatwood and oak/sand pine scrub habitats in Florida. Unfortunately this habitat has continued to dwindle as developers also covert this land. 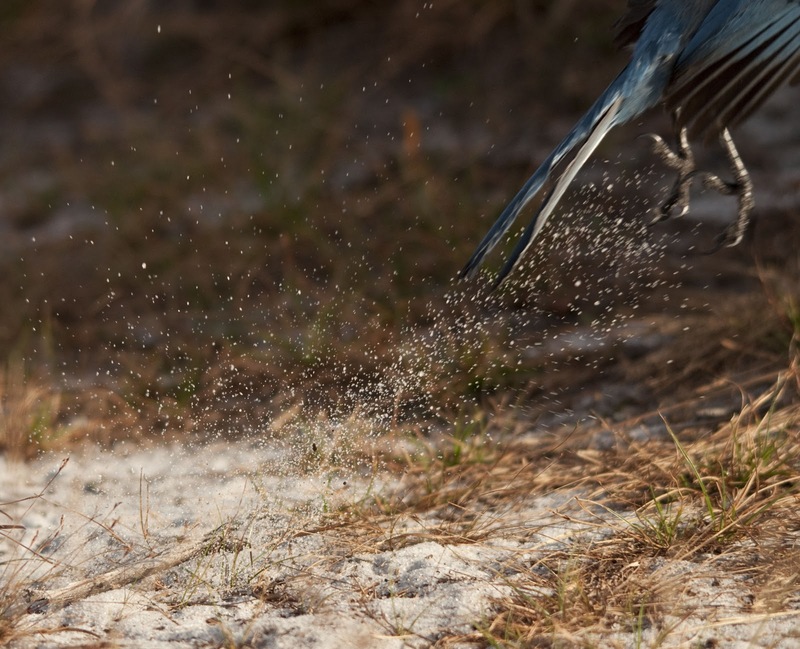 The Florida Scrub-Jay, Florida's only endemic bird, became classified as threatened under the Endangered Species Act in 1987 due to the continued destruction of their habitat. I happen to live in an area of Central Florida, where there are still small pockets of scrubby flatwood that contain concentrated populations of Scrub-Jays. Despite the Florida Scrub-Jay's endangered status, they are typically bold, inquisitive birds that will approach you before you have even spotted them. Watching Scrub-Jays forage can be quite entertaining, as they hop around the sandy ground. 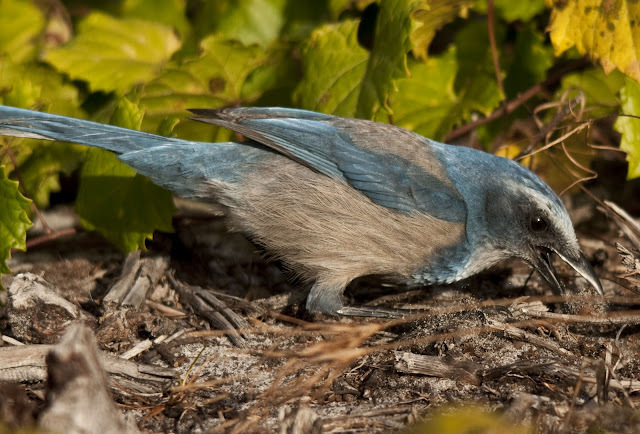 Scrub-Jays are omnivorous, and they primarily eat insects and acorns. 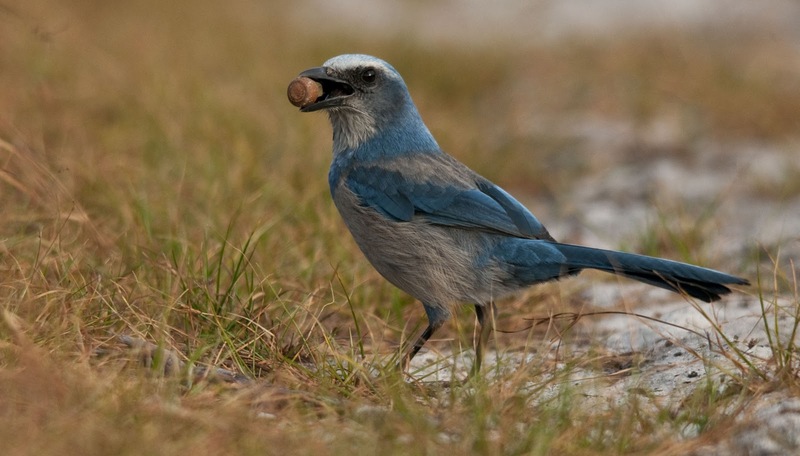 Scrub-Jays will often cache their stash of acorns underground for later consumption. Scrub-Jays open their acorns by cracking them against a hard surface. I recently came across this Scrub-Jay with a bill deformity. I'm not sure if it was born with this deformity or if the bird was injured. This was the first such deformity I've noted in a Scrub-Jay. Hopefully the Scrub-Jays will be able to maintain their populations in the pockets of Florida's scrublands that still exist. Tammy, thank you for bringing the plight of this species to our attention! These are such wonderful photos of this bird! While I have seen the western scrub jay numerous times, I have never seen this species. I do hope that we are able to save it from extinction! A very important post! A great post Tammy, I love these handsome Jays and when/if I return to Florida for a visit I hope to photograph them. I hope more can be done to save their habitat. 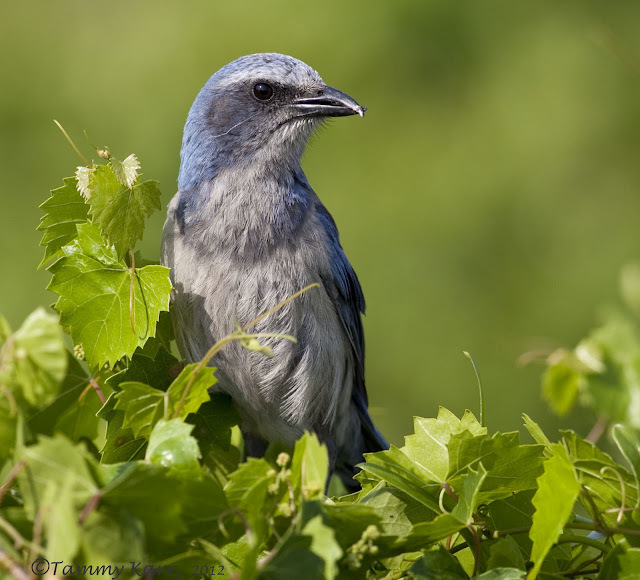 Awesome photos and post on the Scrub Jay! I feel so very saddened by the loss of the Scrub Jay habitat. I do hope more steps can be taken to save these fascinating birds so they can flourish once again. Tammy, your photographs are superb! Fabulous behavior captures! Bonita entrada nos muestras, espero que se den cuenta en Florida de la belleza que tiene y no sigan esquilmando el terreno y esta ave tan bonita tenga un buen terreno para seguir creciendo, saludos. Nice entry us samples, hope will realize in Florida of the beauty that has and not continue esquilmando the ground and this is so pretty bird has a good ground for further growth, greetings. Indeed let's hope the Scrub-Jays will be able to maintain their populations! Blue is fairly rare in nature although there are a few bird displaying that color! Always a wonder to observe! Your photos are a true delight, Tammy, thanks for offering us this beauty! Jays in general are my favorite and the Florida Scrub Jay is in part the reason for this. Several years back I was able to spend some time watching them at Merritt Island. Gorgeous birds with great personalities! Great post! Thank you everyone for the kind comments and feedback. 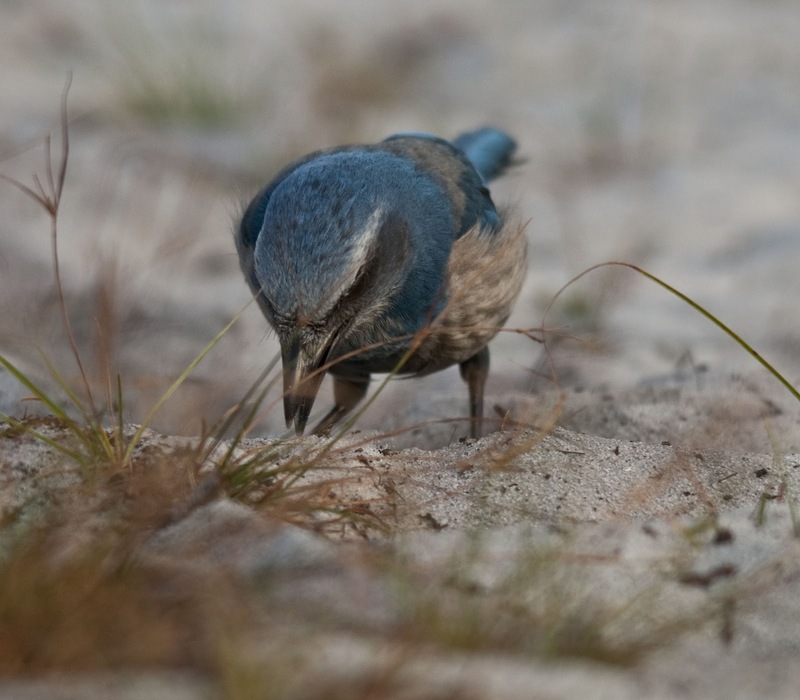 There are a number of organizations, both locally and around Florida, that are working to protect and maintain the Scrub-Jays habitat. They are wonderful birds! Fantastic shots, Tammy! These are one of my favorites.